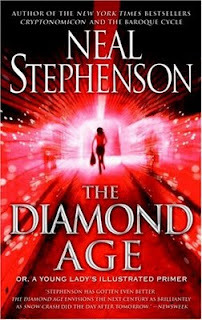 Neal Stephenson's The Diamond Age provided me with an interesting intersection between my M.A. thesis on Fairy Tale Film, and my current PhD thesis on steampunk aesthetic. While The Diamond Age is as hip and technologically futuristic as his earlier cyberpunk apotheosis, Snow Crash, it is ultimately a piece of neo-Victorian SF which plays with the fin-de-sicle European fascination with fairy tales. The main plot thread involves the twenty-first century New Shanghai sub-culture of the Victorians, or Vickys as they are called by other sub-cultures, or "tribes." I imagine the Vickys to be what the current steampunk/neo-Victorian subculture would become if nanotechnology could perform as Stephenson imagines it. The Vickys are luddites of a sort, interested in real paper in a world where nanotechnology has enabled computers to be paper-thin, to be smart pages capable of displaying image in the same way computer screens do. The nanotechnology of The Diamond Age exemplifies and illustrates the "magical technology" of one of my earlier posts in a way few steampunk works have imagined. It can create islands peopled with mythical creatures, install weapons beneath the skin, or create motion capture grids onto actors faces. Stephenson echoes the malleable cyberspace of Snowcrash with this real-world nanotech to enable the action of The Diamond Age to be played out in real, not virtual space. That said, there are many virtual moments. Eschewing old ground, the virtual reality of The Diamond Age contrasts that of Snowcrash in a number of ways. The Young Lady's Illustrated Primer, the subtitle of The Diamond Age, is a remarkable book created by nanotechnology with the intention of teaching a young woman everything she would need to know to thrive in Victorian society. This intention is subverted when the book is inadvertently stolen in a common mugging and given to a lower-class girl named Nell. Since the book is a form of artificial intelligence, it adapts its content to suit its new reader, adding new elements such as self-defense instruction to augment etiquette and core education. It is through the Primer that Stephenson makes his first overtures to the fairy tale, but a close second reading of The Diamond Age would likely show that Nell's story is a fairy tale from its inception. This is very clever on Stephenson's part. The inclusion of fairy-tale elements not only sets The Diamond Age apart from earlier (and subsequent) steampunk, but is a perfectly acceptable addition to the sub-genre, given the fervor with which late Victorian culture embraced the fairy tale, not only those of the oral tradition as mediated by the Grimm brothers, but the original works of Oscar Wilde and Hans Christian Andersen. Fairy tale studies have demonstrated repeatedly how these tales were meant to be didactic stories to teach morality and ethics. Stephenson plays off of this idea, providing Nell with an education that elevates her status in the society of New Shanghai. She is intelligent, dangerous, and yet ultimately incomplete. What she lacks, the story concludes, is a mother. Although Stephenson ends The Diamond Age as abruptly as Snow Crash, the former's stage has been better set for how events might play out beyond the book. In Snow Crash, Stephenson never quite commits to the novel's conceit concerning the Ba'al Shem who can hack language and therefore produce massive change. In The Diamond Age, nanotechnology provides a magical technology requiring only vague explanation to justify mechanical steeds and matter compilers. Besides, the conceit of The Diamond Age isn't technological, it's sociological. The story is about family, with the mothers and daughters who abound in fairy tales and fairy tale criticism taking center stage. And unlike the criticism, which tends toward abstraction, Stephenson is clearly making some strong statements about the family, and about filial bonds: "In a world of abstractions, nothing was more concrete than a baby" (166). Accordingly, unlike The Difference Engine, The Diamond Age is ultimately a very hopeful book. It does not posit a dark future, but suggests the hope of a better one, not within the manners of the Victorians, but within the embrace of a mother. While this might be construed as fairy-tale-optimism, more fantastic than the premise of nanotechnology, it is the conclusion of both Fitzpatrick's War and Mainspring. Adventure occurs on an epic scale in all three books, but the ultimate conclusion finds the hero back at hearth and home. One might even suggest that The Diamond Age isn't steampunk. With its nods to Rip Van Winkle, Sleeping Beauty, and Cinderella, and its conclusion that "there's no place like home," it's a fairy tale with a steampunk aesthetic. 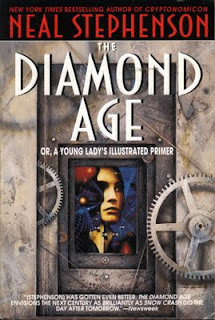 As a post-script, I just want to mention that the cover of the latest version of The Diamond Age constitutes one of the stupidest marketing moves I've seen in quite some time, given the popularity of steampunk. I would rant, but I'll simply display the cover, and let you assess for yourselves. I got the unabridged version of this as a book on cassette tape for $5 at an outlet mall years ago. I'd never heard of Stephenson (or anything steampunk) before. I still have all ten of those cassettes even though I have no way to play them. Now I try to shove it down the throat of anyone who uses the term "steampunk" with me, chasing them down dark alleys to make them read this, if nothing else, that Stephenson's written. And I agree. The cover is pointless. "Stephenson is clearly making some strong statements about the family." Indeed. I also found his dialogue on hypocrisy (190-1) to appear quite pointed, yet sincere. In combination with the apparent inevitability of the ending, though, I wonder if you could build a case for the book almost having a 'conservative' or 'Western' sensibility? Great book, great review. Off-topic, have you read Stephenson's Cryptonomicon, Baroque Cycle or Anathem? Keri - I absolutely love the unabridged audio version, which you can get for mp3 players from Audible.com. That's how I digested most of the book, and thought the reader was brilliant. Michael - I had the same thought regarding the dialogue on hypocrisy. And yes, I would say you could easily build a case for a certain type of conservativism, but not in the Republican sense. As for the other books, Cryptonomicon will have to wait as it doesn't have anything to do with my research, but both the Baroque Cycle and Anathem are on the list of books that skirt the edges of neo-Victoriana, so they're not quite so far down my reading list...but definitely after works that can clearly be identified as containing a steampunk aesthetic. I have a copy of The Diamond Age and am going to read it once I finish The Difference Engine. I should actually get the MP3 version, it would be easier to find the time that way. Thanks for the reminder about Neal's book. This book sounds fantastic. Thanks for the mention. Most of us book bloggers are drowning in our to-read piles (like, seriously...mine's going on 60 books, and that doesn't count any academic reading), and reading challenges are great ways to motivate us to read specific books by a specific time. And since steampunk seems to be the genre on the rise (according to those on the inside), we want to be prepared. Well...at least cognizant of a few of the major works and themes. 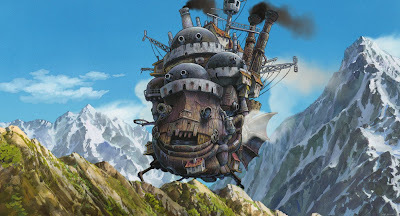 All that said...can you recommend any articles on the rise/direction/work in steampunk during the last 5-10 years? I know that's an academic cop-out, but it'll be easier to find something through my university's weblink to JSTOR than at my local public library. Celi.a - that's just the problem. There really AREN'T any articles on Steampunk written by academics. Only a handful. Stefan Hantke wrote "Difference Engines and Other Infernal Devices: History According to Steampunk" back in 1999 for Extrapolation; Howard Hendrix has an article at Verniana about Phileas Fogg and Steampunk which is VERY good. One of my faves. I have an article coming out from Verniana, hopefully before the end of the year, and another in the cooker at the Journal of Neo-Victorian Studies. Dru Pagliassotti is another person to watch - good thoughts at her Ashen Wings website. Barring that, I'd say roam around the blog here - we steampunk scholars are building the discourse on the subject - it's a work in progress! Regarding 'conservativism': do you think the tension between the (surely sometimes superficial?) social conservatism / nostalgia of the Neo-Victorian vs. the radicalism of the 'punk' elements of steampunk will be one of the main themes of your emerging discourse? 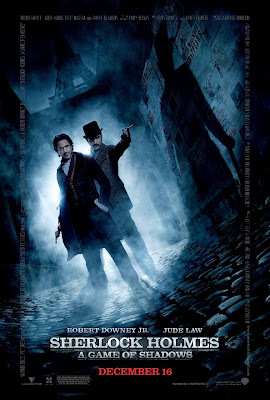 I wonder also whether you've seen good examples of serious alternative-conservatism or radicalism (by which I do not mean any mainstream varieties of Republican, Democrat, Liberal, Blue Tory, or Libertarianism, of course) in Steampunk?